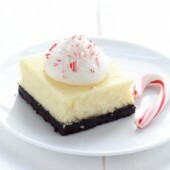 Creamy white chocolate peppermint cheesecake bars with a chocolate crust and a dollop of peppermint whipped cream! A fun holiday treat for the entire family! Preheat oven to 350°F. Line an 8x8 baking pan with parchment, leaving overhang on two sides. If necessary, hold parchment in place using binder clips. Lightly grease remaining sides of pan with baking spray. Combine chocolate cookie crumbs with granulated sugar and melted butter. Press into the bottom of the prepared pan, creating an even layer. Bake for 10 minutes. In a small bowl, melt white chocolate in 30 second intervals, at 50% power. Stir chocolate between intervals. Repeat until completely melted and smooth. In a large bowl or stand mixer, beat cream cheese until smooth and fluffy. With mixer running on low, slowly add sugar. Mix in melted white chocolate, followed by heavy cream and peppermint extract. Add one egg at a time, mixing well between additions. Beat until completely smooth and no streaks remain. Poor batter into prepared pan. Bake for 45 minutes. Cool to room temperature on a wire rack, then transfer to the refrigerator to chill overnight. In a medium bowl, beat together heavy cream, peppermint extract and powdered sugar until stiff peaks form. Chill until ready to use. Using a sharp knife, carefully slice cheesecake into desired sizes. Prior to serving, add a dollop of whipped cream and a sprinkle of crushed candy canes.